Spring: it’s the perfect time of year to refresh your approach to safety. It’s time that you have the ability to track incidents from entry to closure…each step of the way, you should be fully informed. Make sure you can, and do, capture the critical details along the way to uncover an accurate root cause. No spring cleaning list would be complete without this one! You know one of the best ways to improve risk management is to be as consistent and organized as possible in all your processes. To start, iReportSource gives you one, centralized location for ALL your safety documents. That’s right: using iReport means you can throw out old SDS and safety procedure binders and never worry about manually tracking employee training progress again. You can also use iReportSource for a guided, consistent way to report injuries, near-misses, or to track safety activities like safety audits or site inspections. Now that will give you joy! One way to really clean up your safety program: move away from your dependence on paper. iReportSource helps you spend less time on compliance paperwork, so you can spend more time creating safe work practices and boosting employee engagement. More than ever, workers need tools and support so that they can speak up if something is unsafe or if they spot a hazard. 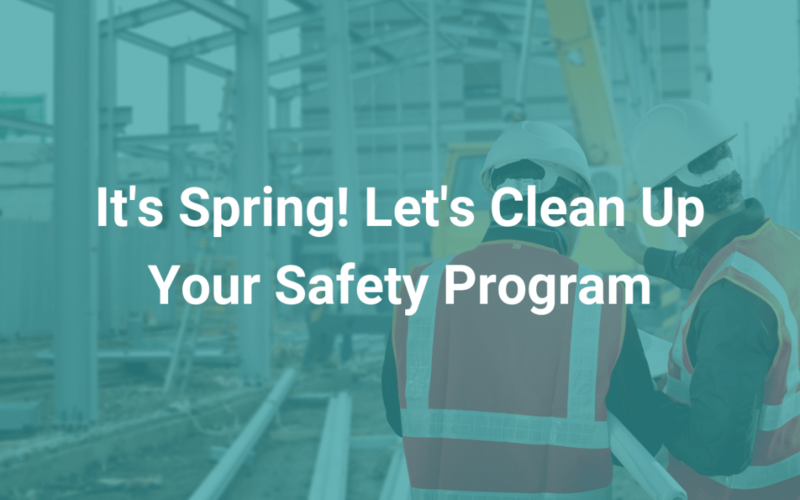 Clean up your safety program by investing in resources and training so that you create a climate where workers look out for each other and feel safe enough to speak up when needed. The problem with spreadsheets can be the amount of time it takes to continually collect and then update your data so you can get the outputs you’re after. By the time you finish working in the spreadsheet, the information or the results can already be outdated! Solutions like iReportSource support standardized data collection that is both accurate and unbiased…not to mention it’s streamlined so gathering the data is much easier for you. That means you’re getting better data your organization can put to use to improve safety immediately. Giving feedback is one of the top ways to create a positive working environment! Still, It’s so often forgotten about. Refresh your safety program by using positive reinforcement, authentic signs of appreciation, and the right kind of verbal or written praise. These genuine efforts can go a long way in supporting any safety program. It’s also another way that shared values and competencies can be ingrained in your culture of safety. Ever notice that the safest companies tend to be those that have a high level of attention to detail? Whether it’s dedication to cleanliness or careful attention for the facility’s upkeep and maintenance, or diligent housekeeping, get on track when it comes to paying attention to—and caring about—every detail. Part of that is mindset and attitude. If the culture of the company doesn’t cut corners and never takes shortcuts, it’ll show and safety will be uplifted, too. Get organized and kick paper to the curb with iReportSource. Our digitized process ensures no piece is ever overlooked and that actionable insights for your organization are always just one click away. Learn more about how iReportSource can clean up your safety program today.